I live in Cape Town and most probably always will. Despite being bitten heavily by the travel bug in my early twenties, and travelling all over the world, South Africa is and always will be my home. I have been writing (to myself mainly) for a few years, and friends have always encouraged me to take it further. March 2010 was the official month of launching My blog. The freedom to be creative, and the chance to voice your opinions to people who are like minded. Its like a mini publication and a great sense of achievement, plus its fantastic to receive all the advice and comments from other foodies. Hmmm, yes, some days I'm so knackered, I just look at my camera and groan. I take a majority of my photos outside and getting parsley to stay put in this windy City is near darn impossible. Chasing after morning light is become one of my hobbies. pink apron at the age of 7 and cooking. I think my speciality then was rock cakes, because, well they always came out like rocks. When my mother realised that my talent was quickly overtaking her own I was put to good use and allowed me to cook the evening meals. Both my grandmothers are fantastic cooks, and I would spend many hours watching and gleaning as much as I could from them. I blog at home, and have become a bit of a recluse, sitting on the couch and typing on a Saturday evening. or my caramel snaps with lemon sorbet. I think I like to keep everyone guessing. I follow as many people as I can, I am so fond of so many blogs, and especially their writers. 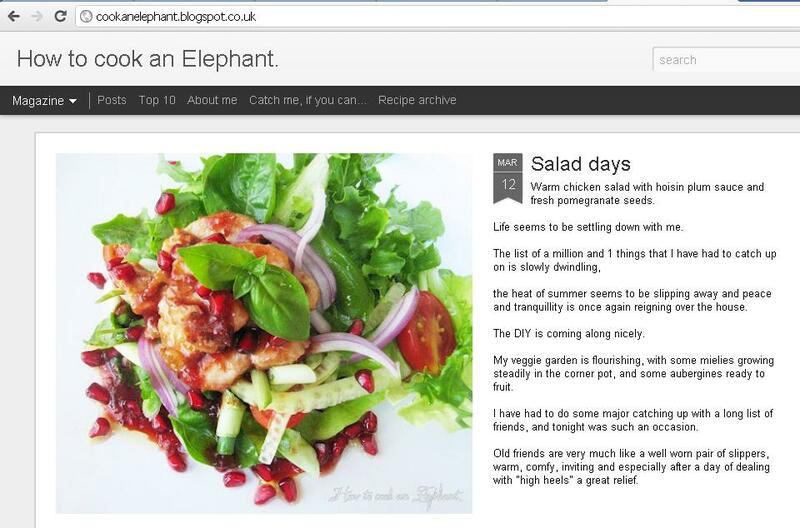 The food24 foodies are a fantastic community, there is always someone posting a delicious recipe. Scrumptous South Africa, BrownieGirl, Shaz, Leaine's Kitchen, Janice Tripepi, Fired Up Cooking, My Easy Cooking, ChefCaro, PinkPolkaDot, Tastes&Treats, Lavender&Lime, Daily Dose of Fresh are just a few of the blogs I follow. Oh dear, I always dread this question. What would I order? There is so much to choose from so many amazing flavours, I would feel so sad to only have to choose one meal! Not only is this such a depressing question, because it reminds me that I'm going to be missing out on all the other things to taste. I JUST CANT CHOOSE! sob.